Yes, I know I’ve been presenting a lot of chile pepper recipes lately. But, well, ’tis the season. And when nature speaks, ya gotta listen. So I promise a chocolate recipe up shortly — fortunately, chocolate is an all-year round kind of thing — but I wanted to preserve a nice bag of jalapeños that happily made their way into my Paris kitchen. And since they’re something you don’t see at Parisian markets, I wanted to make my bounty last as long as possible. So I decided to preserve them for my next Mexi-fest, and pickle them in the style of those you find at taquerias, where they’re used as a condiment. I love the taquerias in San Francisco with their condiment bars (the one at Pancho Villa comes to mind…) where you can help yourself to a variety of salsas, chopped cilantro, onions, radishes, and pickled jalapeños, carrots, and onions. I usually stand there for a minute, stunned at all my favorite things in one place, then try to load as many of them onto my burrito or tacos as possible, without drawing undue stares. I always try to pick out as many of the carrots as I can, since I like those a lot, too. So if you’ve even been to Pancho Villa and wonder why there aren’t any carrots in the pickled jalapeño pot, it’s likely that I was there having lunch that day and got there before you. Jalapeños can be pretty spicy and if your guests aren’t used to spicy things, you might want to give them a heads-up before they shove handfuls in their mouth. Especially if they’re not accustomed to eating highly spiced foods. And these certainly fall into that category. 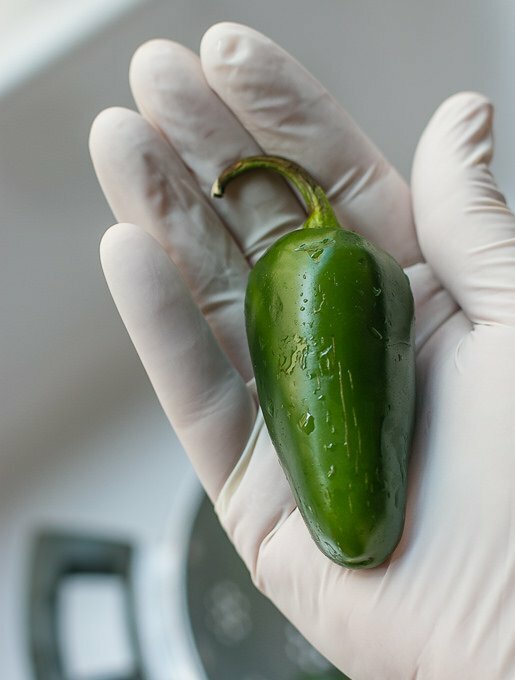 The jalapeños, of course, are great on tacos or burritos, but they’re also nice on hamburgers, chili with chocolate, or alongside carnitas (and margaritas! ), in case anyone is interesting in dialing up the heat. When you transfer the mixture into the jars, you should have just enough brine so that they’re barely submerged. Press them down with a spoon, cover, and let them stand overnight as they will continue to pickle in the jars. The next day, if you should need more brine, simply heat together equal parts vinegar and water, and pour it over the mixture in the jars.If you’re interested in canning the peppers, at the end of the recipe I’ve linked to a good source on canning tips and techniques. I do prepare the jars by pouring boiling water in them, as well as over the lids, and letting them stand for about 5 minutes. Then I use tongs to carefully tip the hot water out and let them dry, overturned on a cooling rack, until they’re ready to fill.Wear latex or rubber gloves when handling the jalapeños and avoid touching your eyes when handling them, as you’ll find yourself in a bit of pain if you do! 1. 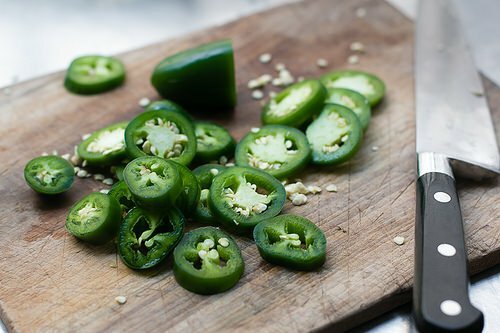 Slice off the stems of the jalapeños and cut them into rounds slightly shy of 1/4-inch (.5cm). 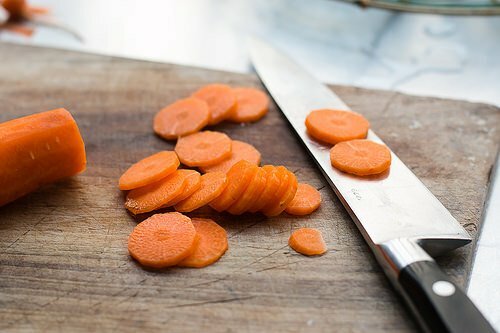 Peel the carrot and cut it into 1/4-inch (.5cm) slices. Peel the onion and cut it in half. (Reserve the other half for another use. Slice the onion into 1/4-inch (.5cm) slices. 2. 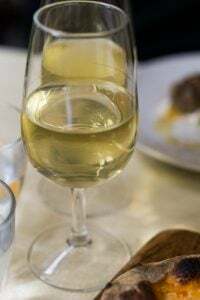 Heat the vinegar in a nonreactive saucepan with the water, garlic clove, salt, sugar, oregano, peppercorns, and bay leaf until simmering, and the salt and sugar are dissolved. 3. 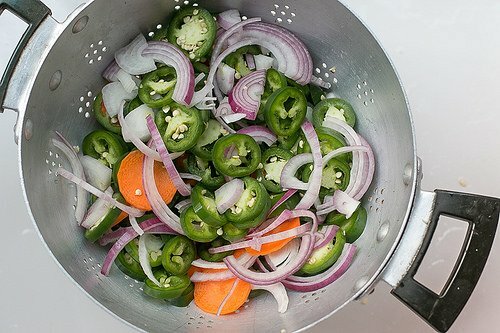 Add the jalapeños, carrots, and onions. Let cook in the pan for 1 minute, then cover, remove from heat, and let stand 15 minutes. 4. Ladle the mixture into jars, close them, and refrigerate until ready to serve. Storage: The pickles will keep for at least a month in the refrigerator, and will start to lose their oomph after that. For canning tips and guidelines, see the National Center for Home Food Preservation website. 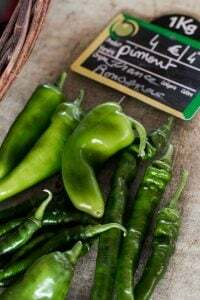 (In France, fresh jalapeños are available via mail order at L’Épicerie de Rungis). Now if only I could find Jalapenos anywhere around here I’d be a happy woman! If not, places like Wiltshire Farms and South Devon Chilli Farm in the UK have them. 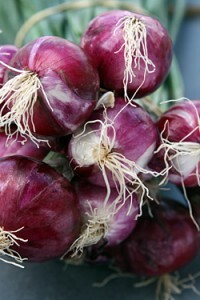 In France, L’Épicerie de Rungis carries them – I added that information to the post. dammit, I came looking to find where I could find jalapenos in Paris! Here in the land of abundant jalapenos (and other chilis) I put up 8 quarts of pickled jalapenos late this summer as my husband eats them like candy and why should I buy already pickled ones in the store? I left mine whole, although I pierced each with a knife, and also added onion, garlic, carrots and oregano. Mine also contained a teaspoon in each jar of canola oil, as the canned ones he loves had it too. I did do a hot water bath so that they’re shelf-stable. Forty years ago when we met, he was telling me (who had never had jalapenos before) that “the carrots aren’t hot”. Well I fell for that hook, line, and sinker, and it’s still a running joke between us. Very timely recipe and the photos are beautiful. Those fabulous jars make me swoon! A flea market find? Looks like pickled jalapenos are popping up all over the place, and nothing could make me happier. I have my regular go-to recipe, but that doesn’t mean that once that jar runs out, I wouldn’t go for another take…. And given how hot some jalapenos can be, I think that dispersing some of that heat to unsuspecting carrots and onions just might be a good idea. Thanks! One of my favorite ways to use pickled jalapenos is to drain and sauté them with onions to put on burgers. The heat tones down a little but doesn’t go away entirely. So good! A few years ago a friend requested I can some of my crop of jalapeños using a bread and butter pickle recipe — he had tasted them made that way and said they were excellent. I found a Martha Stewart bread and butter pickle recipe that includes whole mustard seeds, celery seed, peppercorns, turmeric, and hot pepper flakes or dried chilis. Anyway, they were delicious and now I make them every fall. And yes! Don’t forget the glove!! The pickled carrots/onions/jalapenos at Mexican places can be so hit or miss even at the same establishment – sometimes its really spicy, sometimes not spicy at all, sometimes everything is underseasoned and my least favorite, sometimes everything is mushy. By losing their ‘oomph’ after a month do you mean flavor/spicy-wise or do they start to get mushy? I found a deal on jalapenos (I live near Seattle, not Paris) – 8 pounds for about $4 so I tried out a few more recipes besides the pickled ones like yours which I love. I found a recipe for candied jalapeno slices that get milder as they sit – also called Cowboy Candy. I’m a 4 star hot person, my husband is a 2 star but as they sit we both can enjoy them. I’m not giving up your recipe but the next time you have a bonanza you might like these too. I think you have to adjust the weight in grams. 1 pound is 0,454 kg, so a ½ pound should be approx. 230 grams. 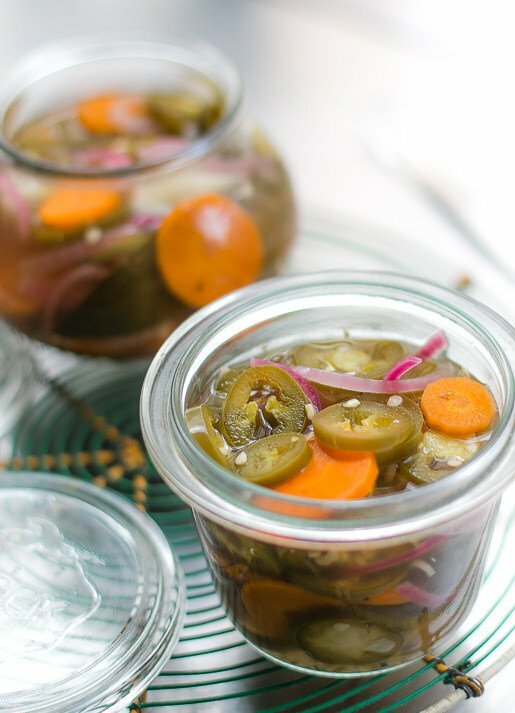 I also love Korean style pickled jalapeños — would love to see your take on that recipe too! Thank you David! Will try. I am also huge fan of sweet hot sliced jalapeños I get here in Dallas, they go into everything from sandwiches to eggs for me. Here in Mexico City we also add cauliflower and often green beans and sometimes jicama sticks to the mix. It rounds out the flavors, gives extra color and makes the mix more interesting. I also would like to point out that it is really important to use dried whole oregano and not the powdered stuff. The powdered oregano will make the mix unsightly and often will give an unwelcome bitter flavor to the vegetables. Try this for a different appetizer: fill pickled jalapeños, which have been halved lengthwise, with peanut butter and serve as a cocktail snack. I got this idea years ago in an article in Bon Appetit magazine about The Fort, an award winning restaurant just south of Denver that features “old west” dishes. We eat the Mezzetta pickled jalapenos all the time–they’re great on just about everything–even stirred into split pea soup! I’m looking forward to trying this recipe–how awesome to make them at home! One more note: David, I guess you know that Mexican oregano (Lippia graveolens) a completely different herb than Greek oregano (Origanum vulgare). They vary from each other in flavor, and of course, Mexican oregano is preferred when making pickled jalapeños. In the last few years, the jalapenos that I’ve been buying and growing haven’t been all that spicy. If anything, they have been downright bland with no heat. And I live in the SF Bay Area. It got so bad that I had to supplement my spicy pickled peppers with serrano peppers if I want any heat. What gives? As a friend of mine would say, “great minds think alike”. 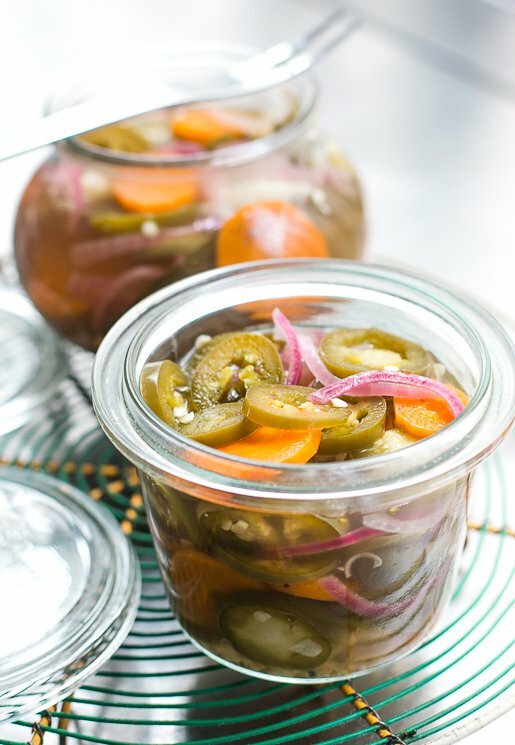 I have just published a pickled jalapeño recipe on the They Draw and Cook website! Very similar to yours, but my Mexican sister-in-law, who taught me the recipe, pickled them whole instead of sliced. No limit to the usefulness of pickled jalapenos. That said I’m addicted to poblanos! Would I be right in assuming from context that a “taquiera” is some kind of Mexican restaurant? Not a word I have come across before. You can certainly get jalapenos in most UK supermarkets, but they just call them “chillis”, and give them a two-tick rating for heat (unlike the little birds-eye ones, or the Scotch bonnets – again, all generically called “chillis” here, but the Jamaican shops specify). I love the ones you can sometimes buy in Lidl stuffed with cream cheese…..
@Annabel, yes, a “taquería” is a restaurant–more specifically it’s a place where they sell tacos. The word ” taqueria “from from taco. A taco is traditionally here in Mexico a corn trotilla the size of a saucer filled with fried meat . Some taquerias specialize in pork, others might add thinly sliced beef ( bistek ) to their repertoire. Many here in Mexico City are popular for their offal tacos with tripe, head, feet being very popular. Usually they are small simple neighborhood places with plastic tables and chairs and not much else. A good taqueria distinguishes itself by having people stand at midnight three rows deep waiting for a place to sit, or by cars parked in two rows up front. Some of the best taquerias here open at night fall and close at dawn. 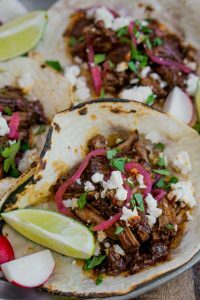 Tacos here in Mexico are served plain with salsa, very rarely with pickles chiles and never with beans, rice or any of the things so popular as side dishes with Tex-Mex food. They are considered a snack and not a meal. The pictures are lovely!!!!! I will keep the recipe tucked away for when I feel like handling jalapeños :) One thing that I think might be confusing is the instruction for the cut veggies. 1/4in is closer to what you have pictured there but 1cm is really really thick. I guess for pickles it does not make too much of a difference for other recipes, I am not sure if I want to slice my onion into 1cm slices (0.5cm is closer to 1/4 inch than 1cm is). barb: There’s a link at the end of the post to a place that will mail order them. 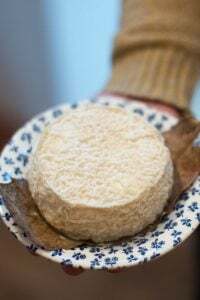 Some people on my Facebook page said they have seen them on occasion at the rue Daguerre market in Paris, as well as at Monoprix on the La Motte Piquette-Grenelle from time-to-time. Nguyen and Jens: Thanks. 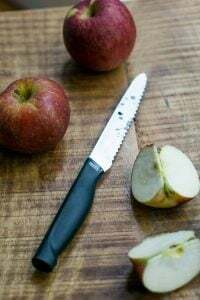 Writing in both forms of measurements is often like writing two recipes and I’ve noticed a lot of bloggers have stopped using both. (I use both here and in my books.) It’s always a challenge to get everything right so thanks for pointing those out. I do include pictures so people can see things as well, which helps! I love pickled jalapeños among other vegetables. Living in South Florida, we eat a lot of smoked fish dip – and pickled jalapeños are the ideal condiment. Smoky A-N-D spicy? Yes, please! Twenty-five years ago when it was safe to drive down into Mexico from Texas my brother used to buy canned pickled jalapeños (with carrots, onions, etc.) to bring back with them. He loved them so much his wife tried to replicate the recipe and her recipe is similar to yours. 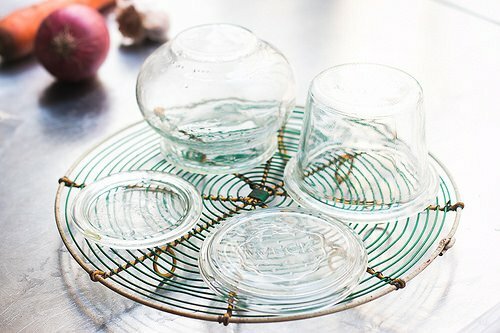 You had me at Weck jars! Aren’t they dreamy? At first glance my eye thought the title of this post was “Picked Jalapenos.” I feared it might be about a hospital visit! Glad not! When I make verduras en escabeche, I add enough jalapeños to make it spicy, but carrots, celery, cauliflower and onions are what I really love to eat, so I include lots of those. I’ve read every one of your articles in the last three years. Tried out several of your recipes — they have never failed me. I admire and congratulate you on your content and style. And photographs too. Would you please do a piece on cooking steak à point? When I was in Cape Town last year I picked up a really delicious jalapeno and garlic relish, so I can see why this would also be yummy. It was particularly divine on cheese. I cook a steak medium. – when meat juices appear – take it off. Apparently it is important that the steak is cut evenly. Now… If you have a thick steak you might want to turn down the heat a bit 15 sec. after you add the meat to the pan so it will not get burned beford you are ready to turn it. My fellow Australians! (to quote former prime minister Gough Whitlam), if DIY pickled jalapeños are a bridge too far, the Sandhurst brand in jars are excellent, can be found in Woolworths supermarkets, probably Coles as well. And I’m not plugging Sandhurst ONLY because I recently got a goodies bag from them, containing said excellent jalapeños, but because the bag also contained a kitchen gadget I didn’t even know I needed – a jar key, or jar popper. A little plastic lever that goes under the lid of a jar, breaks the vaccuum, and allows you to open the jar. Hooray! No more lids pierced with can openers, no more holding jars under a hot tap, no more wrestling with a recalcitrant lid while the guests are waiting for their canapés. Can buy from Amazon, or good kitchenware shops, The Bay Tree in Woollahra for example (another blatant plug). The carrots are my favorite part! I can’t wait to make these. I even have a box of Weck jars that have been in my house forever. 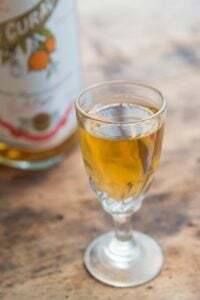 Beautiful shots and great looking recipe. Thanks! I have a comment and a question. Last year the jalapenos that I grew here in NC were very spicy. This year, only one on the whole bush has been spicy, thus far. I learned from a Mexican friend not to pick them until they reach maturity (about to turn red, with crusty brown crackles on the surface here and there) but still not packing much heat. Question – some people in my family have to severely restrict the salt in their diet. Is is possible to make these and other pickled things without salt? Or is the salt required to foster the proper bacteria? Thanks. Here in Mexico people say that if a chile plant gets less water, the chiles are hotter. I don’t know if that is true, but have learned that the grade of hotness varies a lot no matter if it rains or not. I usually use two Chiles Cuaresmeños ( the name for Jalapeños when they are still fresh ) for my 2 scrambled eggs I eat for breakfast. Today when cutting open a green chile it was so pungent that I used just over half. I have found out that if you use less salt, you should make smaller batches, because the vegetable mix does not last as long in the fridge; maybe a week, but not much more. I have in the past canned Chiles en Escabeche and even though they lost some of their color in the process, they were fine as any canned goods tend to be. I opened some after about 14 month and they were still better than any can I buy at times in the store.. I forgot to mention that if the jalapeños are made with less salt it is even more important than normal to always keep the container in the fridge and not take it constantly out and back again. It is important to transfer the amount one plans to eat with a very clean spoon. It’s equally important to not return what is left to the main container. It took me a while to catch on to that fact and I wondered why my escabeche would develop mold. 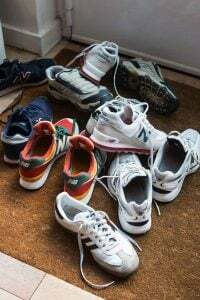 I have for more than 15 years followed those rules using about a third of the required salt and have since not had problems with mold. As far as heat is concerned, it has been my experience that peppers with striations or “stretch marks” seem to be much spicier than the smoother specimens. Do you have any tips for guessing at the heat level without actually eating a piece? Thank you for this recipe!! I only wish I’d seen it had been here sooner, when I had a ton of jalapenos to deal with from my garden! I solved the carrot problem by canning a batch of spicy pickled carrots by themselves, made to mimic the ones in taquerias. I found myself fetching a little dish of them to snack on quite frequently. I just made my first batch of home made Bloody Mary mix and then into the drinks I put a bunch of my pickled carrots and cucumbers, olives, celery. People went crazy!! Love you David!! Thank you for the recipe. I do love jalapeno and go overboard in my garden… I made 5 jars today and am looking forward to try them. For your help in showing me how to cook a perfect steak. I agree with Droelma, sometimes we add more onion and carrot to give a less hot and more sweeter flavor, and sometimes broccoli. 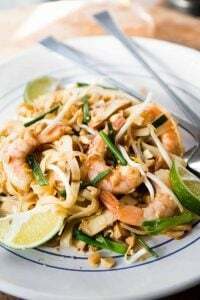 We also would add 3 or 4 whole peeled garlic cloves and stir fry everything with olive oil first. 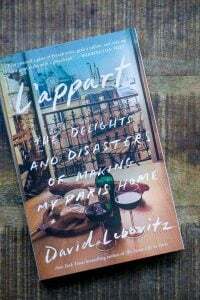 I’m reading The Sweet Life in Paris, and I loved to see that you included a few Mexican recipes like Mole and Carnitas. Saludos desde Playa Miramar, Tamaulipas, Mexico. If you come dont forget to try Jaibas (crabs) al chipotle. I’ve been in a pickle-everything sorta mode for a bit now. These look delicious!